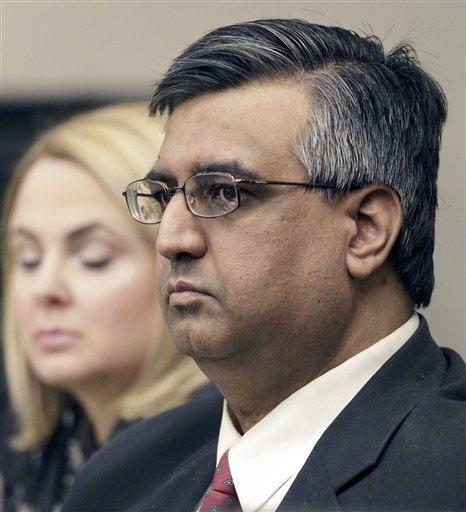 BUFFALO, N.Y. (AP) - The judge in former television executive Muzzammil Hassan's murder trial tried to tell him that acting as his own lawyer to defend against charges he cut his wife's head off was a bad idea. At first, the judge denied Hassan's request outright, relenting only after Hassan and the lawyer he wanted to replace persisted. "He does have the right to steer his own ship," Erie County Court Judge Thomas Franczyk finally said, "even if, unwittingly, he steers it into an iceberg." Hassan was convicted Monday of second-degree murder. During trial, he failed to convince jurors that he'd only decapitated his estranged wife after stabbing her dozens of times because she'd abused him for years and he was afraid of her. Hassan, who was born in Pakistan and was known as Mo, fired three lawyers and replaced a fourth with himself, keeping the fourth as an adviser because he was required to by law. He joins the ranks of Washington, D.C., area sniper John Allen Muhammad, suicide doctor Jack Kevorkian, serial killer Ted Bundy, Long Island Rail Road massacre gunman Colin Ferguson, abortion doctor killer James Kopp and others who've failed to win acquittal after winning the right to self-defend, legal experts said. "It's almost never a good idea," said Charles Carr, a lecturer emeritus at the University at Buffalo Law School. "It's like putting a person who's never played baseball before out in the outfield and telling them, 'You'll catch on.'" Hassan, 46, founded the Muslim-oriented suburban Buffalo television station Bridges TV and opened a studio with his wife to counter negative stereotypes of Muslims after the Sept. 11 terror attacks. Prosecutors said he bought two hunting knives less than an hour before the 2009 attack on his wife at the station. They said that during a 37-second frenzy that began when she walked through the door, he stabbed her more than 40 times in the face, back and chest and then cut off her head. The Hassan verdict, delivered after barely an hour of jury deliberation, seemed to surprise no one who had watched him plod through three weeks of testimony. Hassan called defense witnesses who seemed only to help the prosecution, drew endless objections from prosecutors and put himself on the stand, where he tested jurors' patience by spending four days meticulously detailing years' worth of marital rows with Aasiya Hassan, only to tell them he didn't have "much recollection" of killing her. Carr said he was sure there had been a case in which a person was able to effectively mount a defense, "but it wasn't this case." "If you were going to try to show people how not to do it, you could show them this case," he said. On one damaging day, Hassan called to the stand a psychiatric expert, Gary Horwitz, to describe the traits of an abuser. To observers, Horwitz could have been describing the stocky, 6-footer Hassan, rather than the much smaller wife he claimed had battered him. "They often are not aware they are over-controlling," Horwitz testified. "They would tend to blame the victim as the cause of their distress and problems." Prosecutor Colleen Curtin Gable said everything Horwitz said on the stand supported the prosecution's theory of the case. "And what surprised me," she said, "was that the defendant was acting as though he was getting information that would benefit him." Erie County District Attorney Frank Sedita called it "an incredible lack of self-awareness." Hassan's decision to call his daughter Sonia Hassan on his behalf also backfired after she refused to make eye contact with him and said she "didn't believe in any of the sentences I wrote" after he brought up a letter she'd submitted during a 2008 child welfare investigation. The letter said she did not feel unsafe at home. Hassan fired the three previous attorneys over differences and relegated the fourth, Jeremy Schwartz, to legal adviser during the trial's opening days. The two butted heads over strategy and the frequency of their meetings. Schwartz declined to critique Hassan's performance after the trial but said Hassan viewed his closing statement as a chance to finally express his views. In the statement, Hassan referred to the domestic-violence system as a "religion of patriarchy" that let him down by refusing to recognize men as victims. "Mr. Hassan has felt that throughout the tenure of his marriage no one had listened to his side," Schwartz said. Taking charge of their own defense may guarantee defendants a platform - Kopp, in his 2007 federal trial, tried to advance his anti-abortion cause - but legal experts said there are other ways to be heard. In Hassan's case, "his point of view could have been covered by his being examined by his own attorney," Buffalo defense attorney Joseph Terranova said. "There's no reason why that wouldn't have been done, and it probably would have been much more favorable." Hassan faces up to 25 years to life in prison when he's sentenced next month.